Mike Preston of Windham has run over 1,000 miles in 2016, and he completed it with weeks to spare in the year. Mike, an employee at WEX, doesn’t consider himself a runner. He loves to run, but he’s not obsessed with learning about the sport or following successful runners. He just laces up his sneakers and heads out the door putting one foot in front of the other. “I didn’t think I could really make it,” he said about his 1,000 mile goal. Last year he ran 800 miles. “It just sort of happened,” he said. When he set his goal of 1,000 miles he knew anything could derail his plans like injury, illness or family obligations, but in the Preston household running is more than a hobby – it’s a lifestyle. Mike started running in late 2011 off and on. He was never athletic growing up, preferring to stay in the background and finish gym class runs in the middle of the pack to avoid attention. At the end of 2011, his running friends challenged Mike and his wife, Meesh, a high school sprinter, to run 12 (5K) races in 12 months in 2012, 12/12/12. “It was too cool of a name not to get involved,” Mike said. Once he started running, he realized that he was pretty good at it. The competition of the 12 races kept him going all year long. In 2013, they continued the trend adding in another race. In 2014, Meesh named the running group “Between a rock and a hard pace.” There were 30 people in the group with between 8 and 15 regularly showing up for races. “It’s a community of lots of people we’d have never met,” Mike said about his running friends. “Windham’s great for running,” he added. He also plans to run all of the roads in Windham this upcoming year proving the town is great for runners. “Getting the miles and races in every month kept us on task. We had to stay in shape,” Meesh said. They started doing “fancy 10Ks” next. Then came the “big, audacious goals” like a half marathon in New Hampshire. “Neither one of us said we have to do a marathon,” said Meesh. “Now, that’s the goal for next year,” Mike responded. “I like the challenge (of running),” he added. Using a running app, he worked to reach his weekly goal of 20 miles. In the spring, Mike lost some of his motivation toward his 1,000 miles after the last, big, spring race. He didn’t run much in June, but the Beach to Beacon loomed and he knew he had to get back out on the road in order to be ready for that race and other fall races. “I needed to make sure I got back on track,” Mike said. Mike had help reaching his goal from his running partner Todd Guite, who reached his 1,000 miles the week after Mike. Mike and Meesh enter races together. They don’t run together, but Meesh is okay with that. “He’s at the finish line every single time for me,” she said. One of their favorite races is the Ragnar, a 200 mile race for teams of 12. No matter how rough the conditions or hard the race, at the end Mike can’t help but say how great the race was. “You feel a sense of pride,” he said. They also participate in the Team Kyle race yearly. They have a small room in their home they call the medal room with prizes earned and pictures from the races. The Ragnar races have a special display with the oversized medals hanging from the frame. Although they love the races, Meesh admits that she loves the medals, too. Mike prefers hanging out with his friends. Meesh has never had a gym membership and Mike has no interest in doing bootcamps or working out in a gym. “I can see immediate results,” Mike said. When he finishes a run, he can put in the distance and see the progress he’s making toward his goal. The Prestons have two children, who do not run. Sam, did middle school cross country and has run a few 5Ks, but “he hated every single one of them,” Meesh said. Julia, a freshman in college refuses to run. “You couldn’t pay her to run, except once,” Meesh added, when she paid Julia $20 to run a 5K. Since then Julia and Sam have become great volunteers for the races their parents run in and the Windham High School Project Grad 5K, which Mike and Meesh coordinate. “I love running in the middle of the dark road at night with the moon and stars,” Mike said. He’s not done running just because he made his goal. He set another goal to run at least a mile every day in December and he’s on track to meet that one. He also plans to run another 1,000 miles next year. In my view, the 127th Legislature was a great success. We addressed the opioid addiction crisis, invested in our infrastructure and schools, and made our welfare laws more sensible, among many other things. For my part, I am very pleased that my bills protecting children from abuse, keeping the election polls free from intimidation and improved carbon monoxide safety regulations were all signed into law. But the time to reflect on what we have accomplished is over. Now we must prepare for the next session and a new set of challenges. Over the years I have heard from you about three issues in particular that could use some consideration: Stronger deterrents for would-be animal abusers, reducing property taxes in order to allow folks to keep more of their hard-earned money, and eliminating the all-too-common practice of using hand-held devices — cell phones — while driving. Animal abuse is one thing that has bothered me for as long as I can remember, not only because it is a terrible thing to harm a defenseless creature, but because of what it says about us as people. Are we the type of society that looks the other way and allows this kind of cruelty, or are we kind, sympathetic and sophisticated enough to make sure this behavior is strongly discouraged and severely punished? As a member of the board of directors for the Maine State Society for the Protection of Animals (MSSPA) I see the sad results of animal abuse way too often. Maybe it's time to take bold action in order to significantly reduce cruelty to animals. That is why I will introduce a bill that will make the most serious offenses of animal abuse a felony. We must deter the types of people who would do such a thing by instituting stiff penalties for such a crime. I would like to hear your thoughts on my bill - good or bad idea? Changes you'd make? Also on my radar screen for next year is to address the steady drumbeat of frustration over property taxes. For too long Maine property owners have been taxed to the hilt, and as I and others have pointed out repeatedly, these taxes do not account for how many mouths you have to feed, whether you are on a fixed income, or anything else other than property value. The state addressed this issue in the 1970s with a revenue sharing program, which put 5 percent of income and sales tax back into the pockets of Mainers in the form of property tax relief. Over the years, changes were made to the program: Large cuts were made and the money started being diverted to plug holes in the state and local budgets. In the upcoming legislative session, I will propose to reinstate the original purpose of the revenue sharing program and require that all of the money be used for direct property tax relief, as it was originally intended. Property taxes are critical to funding education and many other pressing needs in the State of Maine, but they must be levied fairly and cease to be such an enormous burden on the working class and those of fixed incomes. Finally, while Maine already has a law on the books that prohibits texting while driving, we all know that any use of hand-held devices while behind the wheel is dangerous. When I see someone trying to dial a phone or send a text and then drifting into the lane of oncoming traffic — and it happens often — I think about the accidents this reckless behavior can easily cause. Sadly, the statistics bear this out. Those who engage in this dangerous activity put other innocent people in serious danger. I plan on re-introducing my bill from last year that will ban all use of hand-held devices while driving. There is extensive research to support the need of my bill. Handless phone devices would still be allowed under my law. It seems to me that when behind the wheel of a moving car, the law should mandate that we pay attention to the road, not our phones. These matters are not Democratic or Republican, liberal or conservative. They are common-sense solutions to problems that affect so many of us. So I am looking forward to celebrating Christmas with my family and I certainly wish all of you a very Merry Christmas and a safe New Year. I look forward meeting my new colleagues in the senate, greet my old friends on both sides of the aisle — and get to work. As always, please feel free to contact me at diamondhollyd@aol.com or (207) 287-1515, if you have questions or comments. This week Colette Gagnon at the Windham Food Pantry accepted 75 pounds of cake mixes and frosting from Dana Reed (right) of Sebago Lakes Ukulele Society (SLUKES). For the past two years members of the SLUKES have gathered to sing and play on the first Thursday of every month in the downstairs room at Buck’s Naked BBQ. 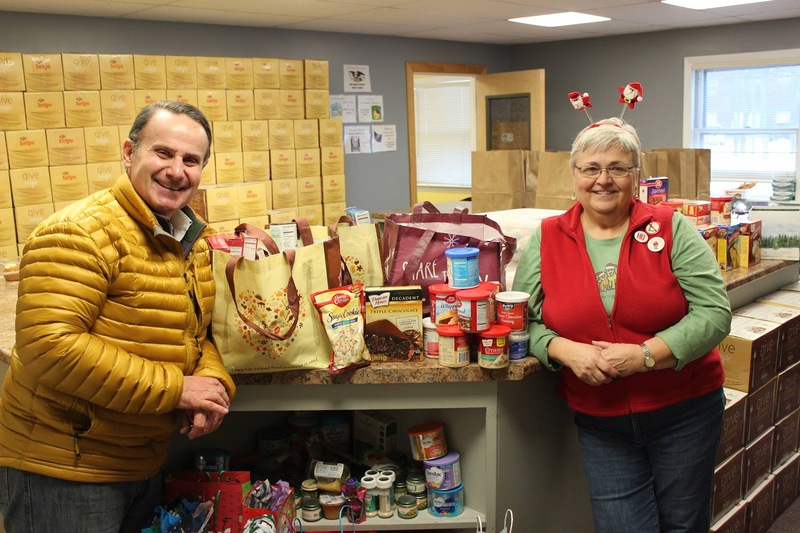 Each month participants bring canned goods or non-perishable food items to be donated to the Windham Food Pantry. Every month, the group’s ‘benevolent dictator’ and musical director Dana Reed weighs and records the amount to be delivered. This month the group crested the 500 pound mark contributed for those in need! Mahalo, nui loa to all its members! 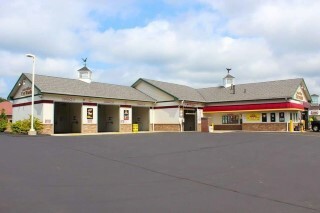 On May 10, 2016, Chase Custom Homes filed intent to purchase property at 660 Roosevelt Trail for the purpose of establishing an Auto Shine Car Wash. As a follow up, earlier this week at a public hearing, the Windham Planning Board members were presented with a 71 page packet reflecting the towns required revisions on behalf of Chase by James Amos, professional engineer of Terradyn Consultants LLC. The plans submitted were for an 8,888 square foot car wash facility and 1,248 square foot auto detailing garage. What that amounts to in consumer terms is two self-service bays, one large automatic wash w/tracks and two smaller versions also with tracks. Currently there is only one other Auto Shine in Maine which is located in Topsham. “This building will look pretty much identical to that location,” explained Amos. Concerns regarding waste water removal were high on the towns list. “Investment has been made with the purchase of high tech water re-use and recycle water system provided by Aqua Bio Technologies. In summary, it’s like a mini-treatment plant on-site. Nothing from the washing process will enter the ground water,” continued Amos. Traffic flow concerns were also addressed.” The access to Route 302 will be limited to right turning traffic for exiting vehicles. No left turns will be permitted onto Route 302 from the main entrance. All customers that wish to turn North onto Route 302 will be directed to the River Road exit, where they can enter Route 302 at the River Road signalized intersection,” said Amos. The resulting unanimous decision was to accept and approve the final plans. For more information, visit www.terradynconsultants.com. It’s unlikely that you could miss the fact that it’s Christmas season. Everywhere you turn, there are decorations, songs, advertisements and displays. Even people who don’t celebrate the holiday probably have at least a basic understanding of what the holiday is about – particularly the secular celebrations. But this isn’t always true for other holidays that are also celebrated at this time of year, like Hanukkah. Hanukkah, which means “dedication” in Hebrew, is a Jewish celebration that lasts eight days. It is a time to commemorate the purification and rededication of the Second Temple in Jerusalem. Though there seem to be several versions (as with most stories from long ago) among historians and scholars of the actual events that occurred, the basic story remains the same. In a time of great oppression, when Judaism was outlawed under Antiochus IV and the Seleucid monarchy, there was a rebellion and the Jewish people emerged victorious. Legend has it that the temple, desecrated and devastated, was reclaimed in approximately 165 BCE, and the troops wanted to purify the temple by relighting the ner tamid (eternal light) to burn constantly in the temple. They discovered that there was oil enough for just one day, but lit the menorah anyway. A miracle occurred, with that small bit of oil lasting for eight days, allowing for time for a messenger to secure more oil. The holiday begins on the 25th of Kislev on the Hebrew calendar, which places the holiday in late November or December. Because the Hebrew calendar is lunar, the date is not the same each year. Hanukkah is not considered a major holiday in Jewish law, and has no restrictions on working, school or other activities. Still, because of the holiday’s proximity to the Christmas season, it has become largely celebrated, particularly in North America. Like any holiday, there are many traditions around Hanukkah, including lighting a menorah, traditional food and games and gift exchanges. One tradition that celebrates the miracle of the oil is the lighting of a special menorah, known as a hunukkiyah, every night for eight days. The first night after sundown, one candle is lit, with an additional candle added each night until there are eight candles burning. A ninth candle, the shamash (helper) is used to light the others. The ritual often includes the recitation of blessings, and the menorah is often displayed prominently in a window to commemorate the miracle. Traditional foods consumed on Hanukkah are fried in oil, another reference to the Hanukkah miracle. Two of the most popular foods are latkes (potato pancakes) and sufganiyot (jam-filled doughnuts). Other traditions include playing a game with dreidels, four sided tops with a Hebrew letter on each side and chocolate coins. Some Hanukkah celebrations also include gift exchanges.